* Information drop-in to hear the latest info & give your views. From Peckham Vision Facebook: At the Community Council meeting on Monday, Network Rail will be reporting on their plans for the Gateway project ie a development of the buildings around the station building. Please come if you can. So far the information that has been released about the Gateway project has raised a number of significant local concerns. Two Peckham Vision papers on this summarise some of the issues to think about and can be seen here: http://www.peckhamvision.org/wiki/Peckham_Rye_Station_Gateway Network Rail have just announced a consultation meeting on Sat 30 November 11am-3pm in the Old Waiting Room at the station (the one partially restored by Peckham Vision over the last few years). This is a very rushed affair with just a week to give responses. It is a key meeting to go to give any views. See here for more info on that: http://peckhamryestation.com/ We will be posting more info later. From Peckham Vision Facebook: Peckham Vision was invited to the launch of Team London Bridge’s Creative Network http://www.teamlondonbridge.co.uk held 13th November 2013 at the Fashion Textile Museum in Bermondsey St (https://www.facebook.com/pages/Fashion-and-Textile-Museum/27012833823?fref=ts). 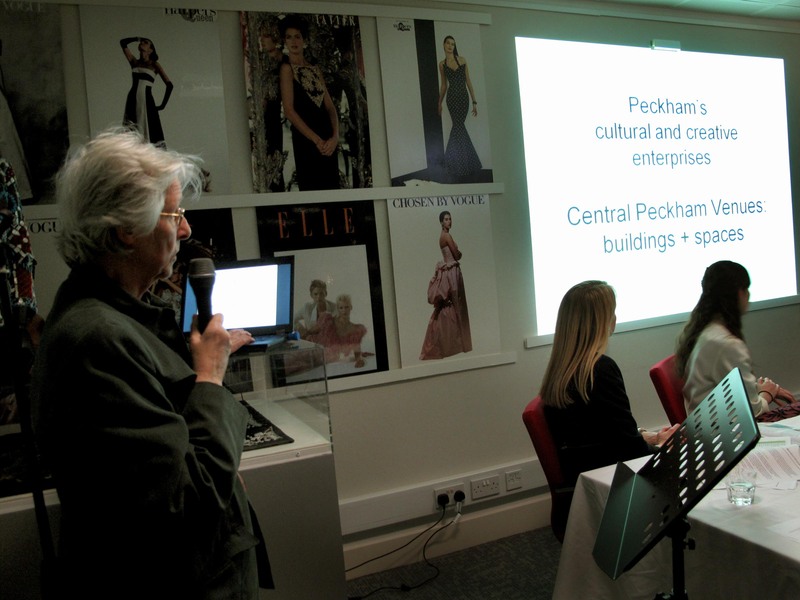 We were glad to contribute by sharing Peckham’s story. Eileen Conn gave a visual tour with photos of the wide variety of artistic and cultural activities now produced by local creative enterprises on the development sites and in the adaptable buildings in the central Rye Lane area – Copeland Park site, Bussey building, Blenheim Grove & adjoining arches, the multi-storey car park, and in Holly Grove & Elm Grove. She told the story of the last 10 years of the community action led by Peckham Vision which had highlighted and publicised the potential of sites and buildings threatened with demolition, and their subsequent use by the creative industries which further supported the community campaigns. This blend of Peckham community action and creative enterprises has led to organic regeneration. A key lesson from this Peckham experience is the need to nurture adaptable, lower cost permanent spaces for organic development.